"Lockheed Martin Corp., Lockheed Martin Aeronautics Co., Fort Worth, Texas, is being awarded a $26,127,742 cost-plus-incentive-fee, cost-plus-fixed-fee order (N0001918F2038) against a previously issued basic ordering agreement (N00019-14-G-0020). This order provides for non-recurring engineering activities associated with the F-35 Autonomic Logistics Information System (ALIS) Security Architecture Phase III design, development, integration and test of the ALIS Sovereign Data Management (SDM) system in support of the Air Force, Marine Corps, Navy and F-35 international partners. This effort provides F-35 international partners the capability to review and block messages to prevent sovereign data loss. Additionally, the effort includes studies and recommendations to improve the security architecture of ALIS...."
Some sort of super-duper anti-malware thing-a-ma-jig. "...International development partners and foreign customers of the F-35 have expressed concern that ALIS, which manages and analyses the fighter’s systems, training and flight logs, would automatically transmit information back to Lockheed’s hub in Fort Worth, Texas, possibly giving the company and the USA insight into their military operations. ...The feature is expected to be fielded in the first quarter of 2019, and will improve system speed and performance as well, according to Lockheed Martin. 2019 lines up with either an update to 4.0 or the ALIS 4.1 release. Dear Lord... How can The Drive get it so wrong? The Pentagon announced the deal, which came through the U.S. Navy, the service that is presently in charge of the main F-35 Joint Program Office (JPO), on Aug. 17, 2018. The Maryland-headquartered defense contractor is set to receive more than $26 million – all of which is funding from the program’s international partners – to craft what the U.S. military is calling the Sovereign Data Management (SDM) system for the Joint Strike Fighter’s Autonomic Logistics Information System (ALIS). Even though they linked to the actual contract announcement, it looks like they neglected to actually read it as the Partner nations are paying only 21%, not 100% of the $26 mil. This order combines purchases for the Air Force ($10,769,545; 41 percent); Marine Corps ($7,895,656; 30 percent); Navy ($1,988,809; 8 percent), and international partners ($5,473,732; 21 percent). If there's two things they're reliably wrong on, it's anything stealthy and the A-10. Wasn't Rogoway still touting the old $100m per unit figure for the -A? "...truly, you might say ALIS is the poster child for the failures within the traditional defense community to understand how best to develop technology. To resurface a tongue-in-cheek comment from Josh Marcuse, director of the Defense Innovation Board, about the Pentagon’s approach to innovation: “It’s OK to fail, you just have to fail very slowly, you have to fail very expensively and you have to fail with a high degree of documentation.” It would appear ALIS met that standard beautifully. The Air Force is moving forward on a way to fix things — a promising and actually innovative approach called Mad Hatter (clever, right?) that one can only hope will also offer up some better practices for future development. 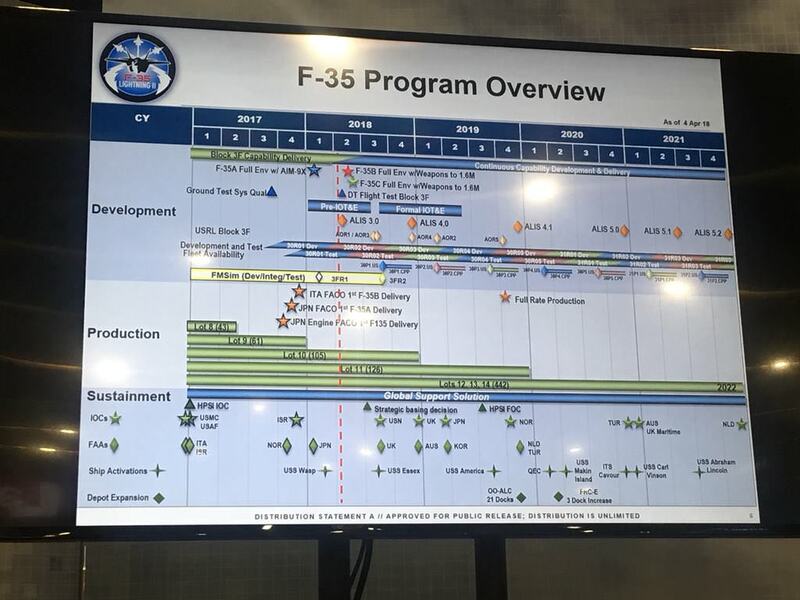 The F-35 is not your typical tech development program. I get that. One might argue that the sensitivity of the data managed by the logistics systems, combined with the complexity of requirements, prevent commercial practices or open standards from being used. But that argument doesn’t hold water. Smart tech development doesn’t happen in lieu of security. Did the defense community understand that back in 2001? Maybe not. But let’s hope everyone knows it now." "How bad is the F-35's computerized maintenance system, ALIS? So bad the plane may be better off without it. ...Pentagon officials have pushed Lockheed to improve ALIS for years. But now, the head of Air Force acquisition, Will Roper, has come up with what sounds like a plan to rebuild ALIS to make it nimbler, faster and smaller. With the wonderful name of Mad Hatter, the plan is to strip the functional software out of the current system and host it on the cloud as a complex of apps, he told reporters here last week. I asked Roper if this meant ALIS would no longer be a big box. He said yes. I spoke with him later and he seems reasonably confident that the code will be stable in the cloud. To be fair, Roper did say that much of the functional software in ALIS — the stuff that does specific tasks — works well, so they shouldn’t need to start from scratch. But the Mad Hatter team needs to repackage that still-usable code into something military maintainers can actually use to do their jobs, instead of something that makes their jobs much harder." Its not a matter of "now thats a bad sign" its a matter of everyone starting to respect the nature of Cyber Warfare, and what China and Russia are expected to bring to it. Well, over the many years I have read some stupid things. i have read some very stupid things. And, I have read some crazy extremely stupid things. Put Alis or parts of it in the Cloud? The thing with clouds is that they leak. => In real world it is called rain, or snow. On the web it means : Here I am, feel free to come and get me. Professional hackers might take some years but 8 year olds "accidently" do it in minutes. vilters wrote: Well, over the many years I have read some stupid things. 'vilters' always delivers because of thinking 'outside the box' and in this case 'outside the cloud' in the 'fog of war'. No? My Facebook was hacked, twice in 5 years. Messenger? Found my messages, but not on Messenger anymore. Social media? Yep, they are V E R Y social. Something like, everywhere. LOL.